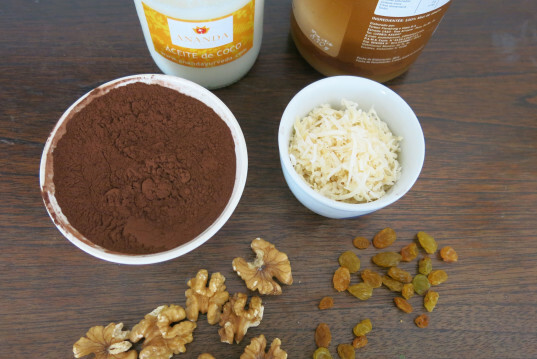 Did you know you can make your own chocolate bar, or bark, from cacao powder and the super versatile coconut oil? Plus, you can add any toppings of your choosing: hazelnuts, almonds, raisins, coconut flakes, whatever you and your kids would like. To make this vegan, gluten and bake-free recipe it's easy and fun. Just heat up the cocoa powder and coconut oil (a cocoa butter replacement) in a saucepan over medium heat, pour the melted mix into a parchment-lined tray and top up with your nut or dried fruit choice selection. Take to the freezer for 15 minutes and the chocolate will come out hard as bark. 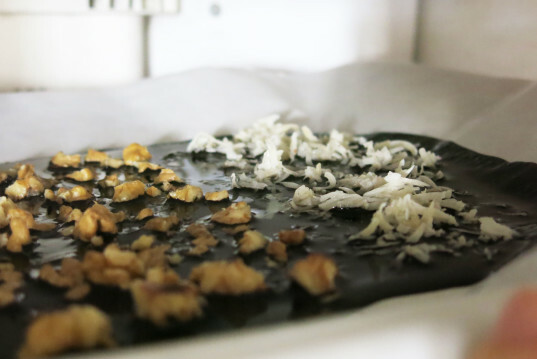 Who would have thought that making homemade chocolate was so easy and cool? 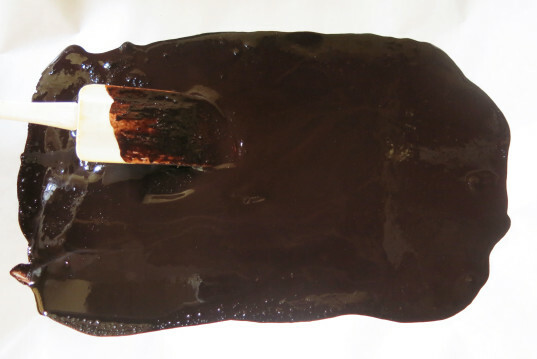 Please note that this chocolate melts much faster than regular chocolate, so be sure to keep it chilled until you eat it. 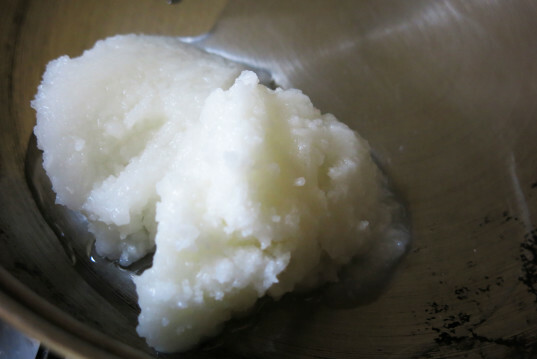 Add 2 tablespoons of coconut oil into a saucepan over medium heat (around 325°F) and gently stir. 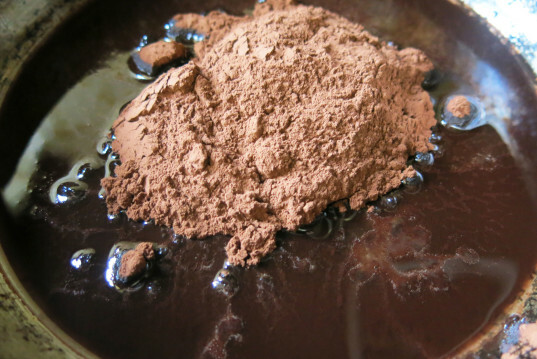 Add the dark cacao powder and stir gently until you get an even mix. Turn the fire off and pour the mix onto a parchment-lined tray. Help yourself with a spatula smoothing it out until it’s about 1/4-1/2 inch thick. 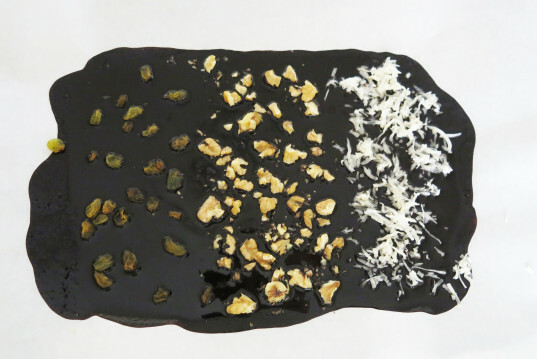 Sprinkle some nuts, raisins and (previously rehydrated) coconut flakes on top of the melted chocolate. Place the tray on a flat surface in the freezer, for 15 minutes or until frozen solid. Once frozen, take the tray out and gently break apart the chocolate into a hard and sweet textured bark. 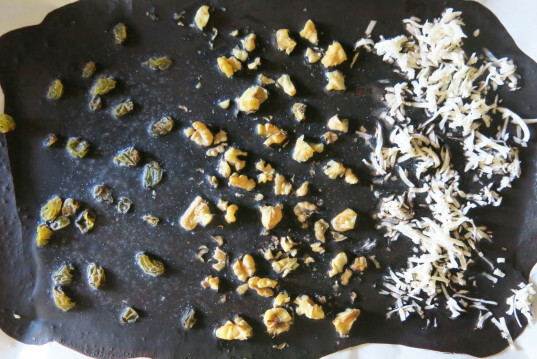 Turn the fire off and pour the mix onto a parchment-lined tray. Help yourself with a spatula smoothing it out until it's about 1/4-1/2 inch thick. 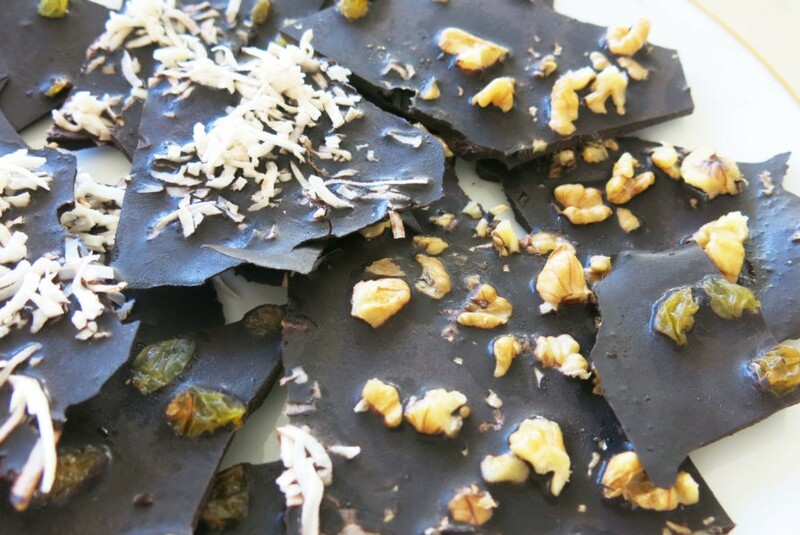 Once frozen take the tray out and gently break apart the chocolate into a hard and sweet textured bark.